i've always been a red lipstick girl, from bright blue-reds to deep burgundys, i have the full spectrum of red lipsticks pretty thoroughly covered, but as you can see my orange obsession has branched out into lip products, so here are some of my favourites. straight away i have to mention the revlon kissable balm stain and revlon lip butter, i'd say these two are my picks of the bunch. they're great for easing into wearing oranges because they're quite sheer when you first apply them but they can be built up to a really deep, pigmented colour. they also both last really well and are much more moisturising than a lipstick, and not to mention lower maintenance. i have lots of shades from both lines of products and i can't recommend them highly enough. i'm a big fan of rimmel lipsticks, i think they're really good quality for the price, they have a great colour range and you can find them anywhere. so when i saw this shade i knew i'd have to pick it up. it's a bright, slightly pink-toned orange and although i haven't gotten a lot of wear out of it yet (most of my outfit choices usually mean red or pink are more suitable) i really like it. as for the lip glosses, i'll mention them in order of pigmentation so first up has to be the MAC lipglass. if you've ever used one of their lipglasses before you'll know how pigmented they are and this is no exception. unfortunately the formula is also pretty sticky, so if you really hate that then i'd steer clear. next up is the revlon colourburst gloss which is great because it's pigmented enough to give you a decent wash of colour without the maintenance of lipstick, i often wear it on its own if i'm feeling lazy. i think this colour may be discontinued but it's worth keeping an eye out for it. as for NYX, i just have to say along with their blushes i LOVE their lip products. i have several of their xtreme lip creams and i also love the soft matte lip creams, and this butter gloss is lovely too. much sheerer than the other two offerings which are more like liquid lipsticks, this one gives a little bit of colour but is perfect if you want a more natural look. the paul & joe and estee lauder offerings are both very sheer but they look great over a lipstick, and of course paul & joe have the prettiest packaging of all time! I have tons of coral lipglosses and lipsticks, I think they're absolutely gorgeous for the summer! Gorgeous products and photos! I thought more about both of these vivid, sweet colours after your last post and think that a coral gloss might be the way to go, because coral lippy just doesn't seem to work on, but I do so enjoy seeing these hues - eye shadow, every once in a while, might be a fun approach, too (and of course, there's always nail polish and I've long enjoyed wearing both colours in that context). *PS* Thank you very much for your lovely comment on my outfit post this week, honey. True, pale purple gloves can be hard to come by. They're a versatile colour when you do find them though. I like to wear them with everything from a wide range of pinks to navy blue to mint green (for extra dose of pastel fun). sometimes i think bright coral lipstick is a bit much so that's when opting for a pigmented gloss really works for me, and also you don't have to worry about checking up on it all day and i never need a mirror to reapply gloss. All of these products look so gorgeous! I'm all for lazy girl lip colours as even though I love lipstick, I really do hate maintaining it and worrying whether it's faded and if so, how ridiculous I look, haha. Orange and coral is such an obsession of mine too. Those kind of shades suit every skintone and adds such lovely colour without being too dramatic like a red can be. I used to love MAC Lip Glasses, but I haven't bought or used one in such a long time! My taste in makeup has definitely changed, but I would love to rediscover them in my makeup collection and use up old products. to be honest i only bought the lipglass because of the colour it is and because it was at the estee lauder corporate store and it was really cheap, so i thought i'd pick it up. and i completely agree, it's such a flattering colour, i think a lot of people don't think it's for them and i never did either until i tried it. I think I will definitely go for that Rimmel lipstick! Although, everything seems gorgeous and nice. I love orange lip colors! I have a few orange/peach/coral lipsticks, but I'm always looking for more. The Revlon lip balm stains are wowing me lately and I really want to try that shade! you really love orange color! lovely make up! 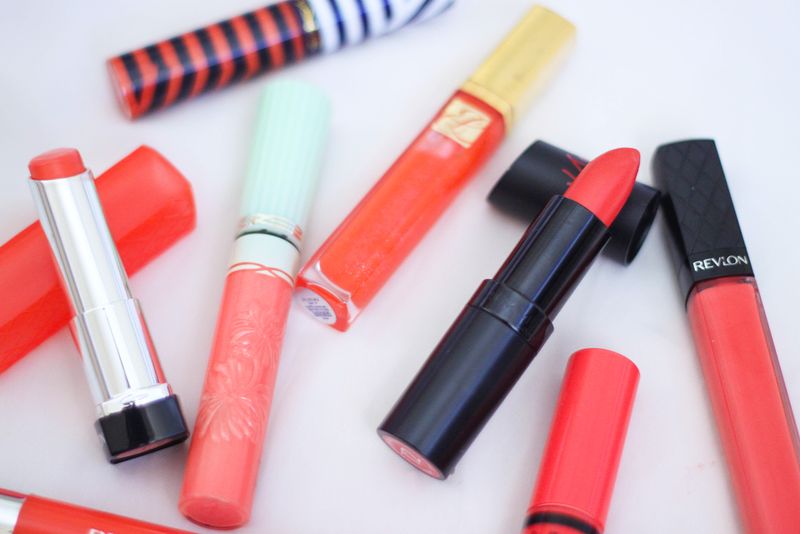 I'm obsessed with coral lipsticks right now. 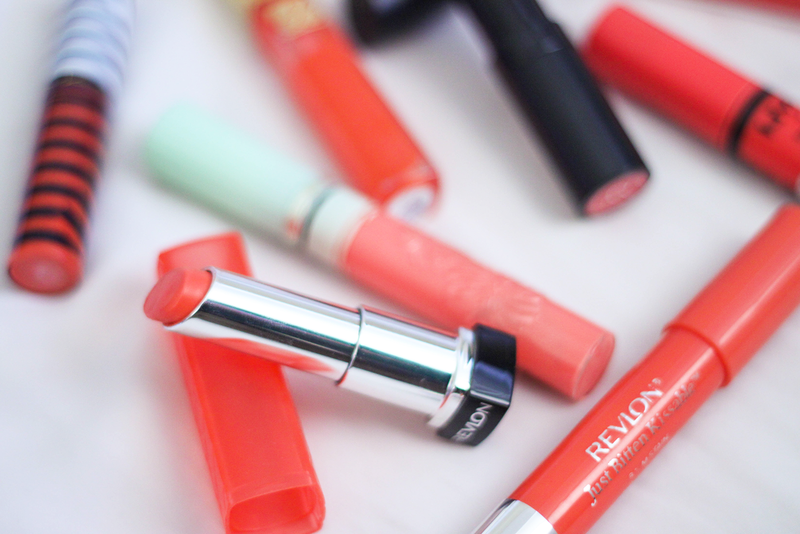 I love the Revlon balm stains and am dying to try the lip butters too! I've not tried a Rimmel lipstick yet, but I've heard such great reviews about them. I'm in the same boat with you but I'm a die hard shades of pink lip girl! i might have to do some swatches/take some photos of me wearing some of them soon. i never though it would suit me but that's why i like coloured glosses so much because there's enough colour to see it but they're not as scary as a full on lipstick. I'm definitely a red-lipsticks person as well, but there was a phase in my life where I wore orange all the time. I reckon if I did want to go there again I'd try out the rimmel one, it looks nice and I do like their lipsticks too! 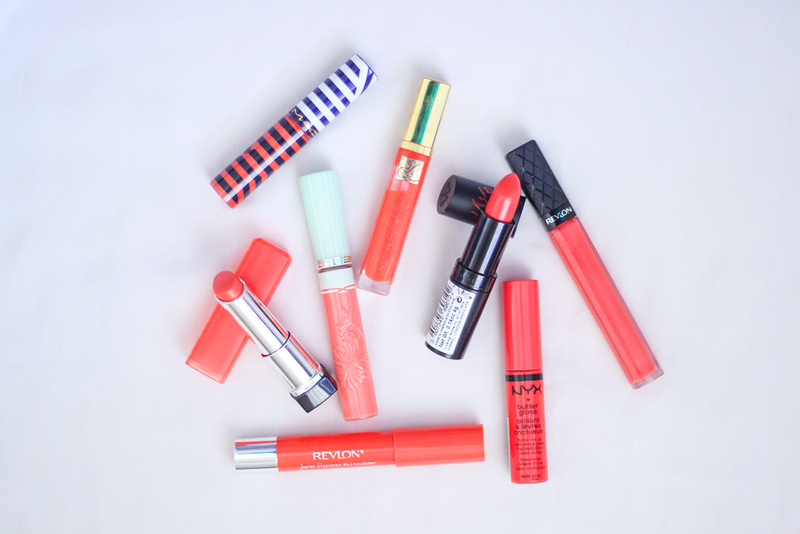 I love Corals so this is a fantastic post to see other lip products with it! You take gorgeous product photos. i'm the exact same, i wear red most days of the week so i like it when what i'm wearing allows for some coral instead. i love these colours! absolutely a gorgeous lipstick colour as well! Everyone seems to be raving about the revlin lip butter! Maybe time to get some! Okay, I am SO in love with this post. I've recently become obsessed with coral lip stain! !